Black Diamond Well Services have designed and are commissioning a range of lightweight modular intervention well services assets specifically to target the current difficulties associated with crane capacity, platform access, weight & size restrictions. Compact Nitrogen Pump is a complementary component for lightweight well intervention. Compact Nitrogen Pump: Black Diamond Well Service’s Compact Nitrogen Pump is a complementary component for lightweight well intervention. 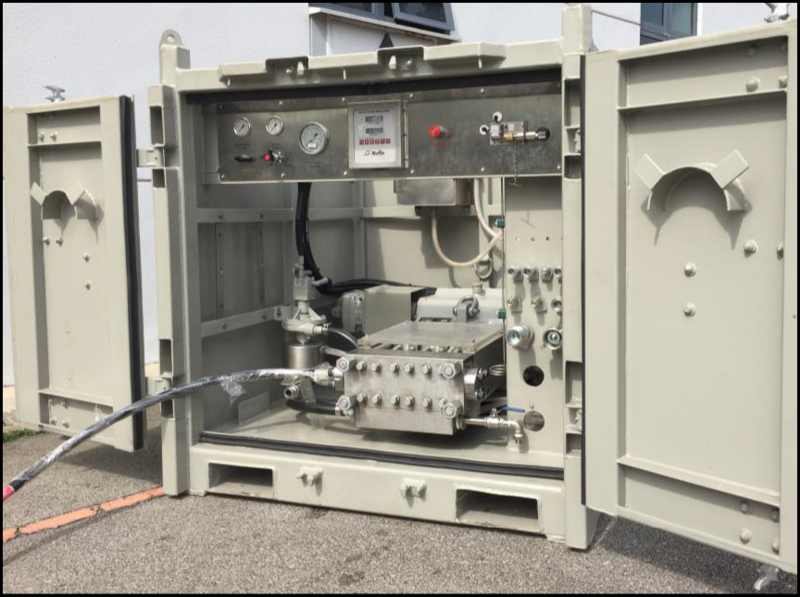 The unit, which can be supplied together with various LN2 tanks including 3MT 500gal liquid nitrogen tanks, offers the opportunity to use high pressure nitrogen injection in locations that were previously inaccessible to nitrogen convertors due to weight and or space limitations. The unit is commonly used alongside Compact Coiled Tubing Packages and in standalone applications. Mounted in a DNV 2.7-1 certified and fully enclosed skid frame, the unit is driven by a hazardous area certified diesel engine rated for a peak power of 80HP. The unit uses a hydraulically driven cryogenic triplex pump raise the pressure of liquid nitrogen before the liquid is heated using waste heat to produce a high pressure gaseous output. 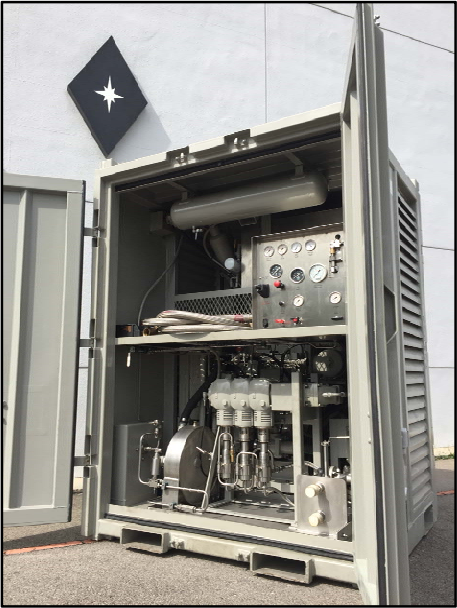 The unit will deliver a nominal discharge nitrogen flow rate of 27Kscf/hr (450scf/min) at pressures up to 10,000psi. Designed as a true compact unit, the NPU-01 requires no onsite assembly saving valuable rig up time and reducing crew requirements. Compact Fluid Pump is a complementary component to light weight well intervention package. Compact Fluid Pump: Black Diamond Well Service’s Compact Fluid Pump is a complementary component to our light weight well intervention package. The BD FP 01 Pump offers a lightweight, compact high pressure pumping solution alongside other compact well intervention packages and or when standalone high pressure pumping is required and site access is restricted by either space limitations or weight limits. Mounted in a DNV 2.7-1 certified and fully enclosed skid frame, the unit is driven by a “standard” Zone II hazardous area certified slick line power pack typically rated for 80hp. The triplex pump is controlled using a hydraulic over hydraulic control system and can be configured to provide flow rates up to 0.75bpm and pressures up to 10,000psi depending on fluid end configuration and power pack in use. Designed as a true compact unit, the BD FP 01 requires no onsite assembly beyond the connection of hydraulic hose saving valuable rig up time and reducing crew requirements. (The associated power pack have typical transport dimensions of 1880 x 1220 x 1420mm). o Containerized design with rigid skid and full opening access doors. o DNV 2.7-1 certified skid frame with sealed base and supplied with certified slings and fitted with forklift pockets. CapCoil Injector Head is unique approach to the use of Capillary Coiled Tubing designed to allow CapCoil strings to be deployed into live wells without the use of a heavy injector. CapCoil Injector Head: Black Diamond Well Service’s CapCoil Injector head is a unique solution developed to allow capillary coiled tubing operations to be carried out in oil and gas wells from a much reduced footprint and with an industry low transport weight. The BD SB 006 Head is intended to be used with the BDWS 3/8” Capillary CT systems. These units are configured either as a single skid combination CapCoil and Slick Line package or in lightweight configuration as a two skid “power pack and winch” design. These systems are ideal when the ability to use pressure and flow activated tools and other low volume fluids and gas injection techniques can extend the catalogue of well interventions ahead of a full specification workover or well services package being required particularly in offshore environments where deck space and crane capacity can be severely limited. Nitrogen Injection for gas lift o Hydraulic Packer Setting and other pressure activated tool functions. High pressure jetting for wax and scales etc With an integrated 5,000psi rated stuffing box, the CapCoil Head is rigged up in a directly on the lubricator reducing lifts to a level comparable with standard slickline operations. The injector allows the 3/8”CT to be deployed and recovered from live wells up to a maximum WHP of 5,000psi. The unit can be supplied with a range of Slickline and CapCoil Intervention tools as well as complete Pressure Control equipment packages. Full Listings are available on request. Hydraulic Drive via planetary gearbox with integrated fail safe brake.